Many fintech companies are successfully disrupting the financial services industry, but traditional obstacles continue to impede fast growth and compliance with strict regulations. In this webinar, you’ll discover how cloud technology offers the necessary flexibility and functionality, at a fraction of the price of traditional telephony systems. You’ll also have the chance to ask questions, so this is a great opportunity to better understand cloud communications and learn how your business can benefit from more integrated, flexible and smarter systems. 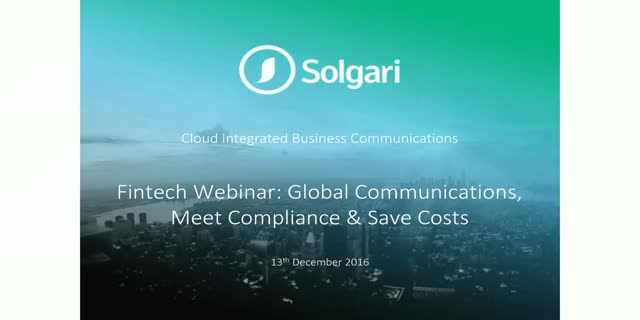 -Learn how to meet all communications requirements today and tomorrow in the cloud. -Hear how cloud technology helps fintech address compliance and reduce audit costs. -Discover how to meet all standards immediately: PCI DSS, FCA & SEC Regulation, MIFID II.